Fundamental researches aiming at realization of compact and high-performance nano devices are conducted energetically. A two-dimensional material attracts much attention as materials to use for such nano devices, and graphene is representative. Various interesting theoretical expectation has been carried out about electrical conductance properties of graphene but it has not been verified much by experiments. The causes include that electrical conductance properties of graphene are sensitive to atomic arrangement. In other words, a technique to measure atomic arrangement and electrical conductance properties at the same time is necessary for experimental inspection. Our laboratory develops such a measurement method and is trying to clarify the electrical conductance properties of graphene nanoribbon. The upper left figure is a photograph of electrodes (3 places) made using electron beam lithography. These electrodes are designed on a 3mm diameter TEM grid. The next figure is an enlarged view of one electrode. There is a gap at the center of the electrode, and the right figure is a TEM image near the gap. As shown by this TEM image, the gap distance is very short, less than 100 nm. By suspending materials such as graphene to this gap, it is possible to observe its structure and measure the electrical conductance properties at the same time. 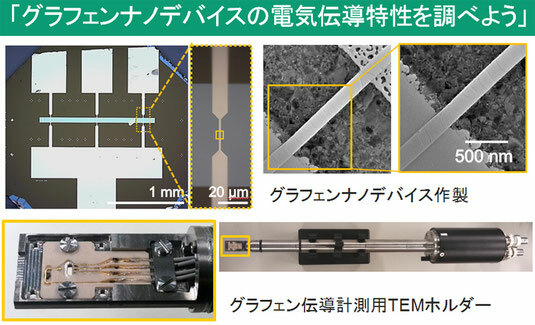 The figure below is a photograph of "TEM holder for graphene electrical conductnce measurement", which can observe TEM by placing the fabricated TEM grid.